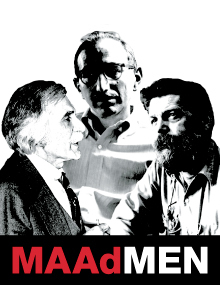 MAAd Men of Mystic is a special exhibition featuring three artists; John Gregoropoulos, Anthony Terenzio, and Paul Zelanski, whose abstract art, while gaining national and international recognition, was also exhibited at MMoA and in the region during the 1950’s and 60’s. In an era when MMoA was known as the Mystic Art Association, abstract art began to appear in galleries, much to the consternation of those who believed art should represent something tangible. Their styles and approaches to creating art and subject matter varied greatly, and though their work may appear tame in this day and age, back then they were considered MAAd Men. The show opens September 26th and runs until November 8th. To celebrate the abstract movement and the spirit of the time, we welcome you to dress the part! Come dressed in 50’s, 60’s, or 70’s style.